good deal of wash to do today. Mrs Johnson came over from Emmas to spend the day with me. Will found Mother some better. Sunday April 10th 1898 "Easter Sunday." We went up home to spend the day. Found Mother feeling some better. Was down at Otts a little while. We came home to do evening work. Wrote some. Monday April 11th 1898 It was a fine day. Will helped me wash in the morning. I put out my little chickens and set some hens on turkey eggs. Callie was up in the afternoon. Tuesday April 12th 1898 I ironed in the forenoon and watched the turkeys some to find the nests. Will went up town and was over home for dinner. I did evening work and practiced some. 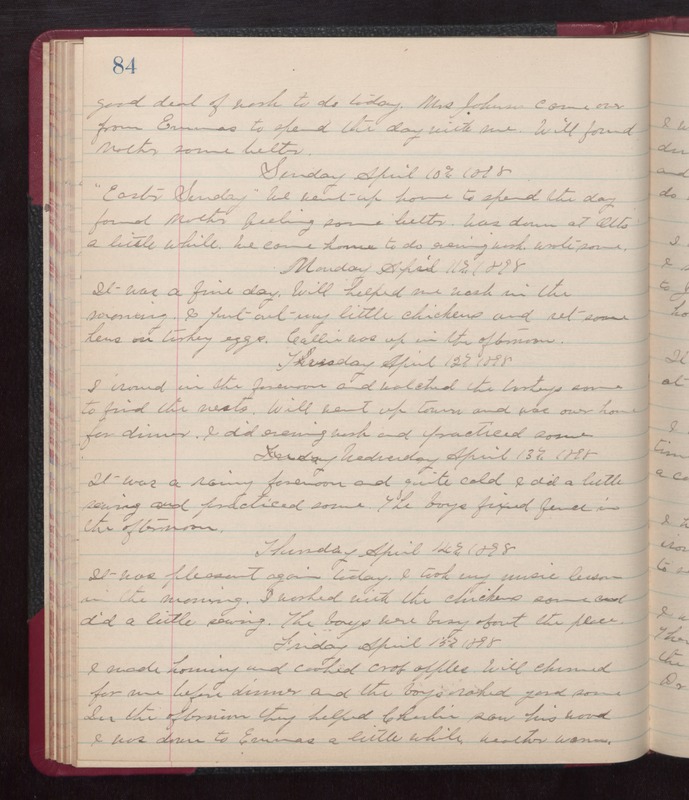 Wednesday April 13th 1898 It was rainy forenoon and quite cold. I did a little sewing and practices some. The boys fixed fence in the afternoon. Thursday April 14th 1898 It was pleasant again today. I took my music lesson in the morning. I worked with the chickens some and did a little sewing. The boys were busy about the place. Friday April 15th 1898 I made hominy and cooked crab apples. Will churned for me before dinner and the boys raked yard some. In the afternoon they helped Charlie saw his wood. I was down to Emmas a little while. weather warm.